This page contains links to all of the free and premium resources for writers I’ve developed or commissioned so far. All of these tools and templates are available exclusively through All Freelance Writing (with the exception of a few being highlighted on other Web properties I own). You can’t get them from anyone else. This e-book guides freelance writers through the first 30 days of their platform-building plan. Add your profile to the professional freelance writer directory to help. Browse the latest freelance writing jobs for free or subscribe to get job leads in your favorite feed reader. Find paying freelance writers' markets to pitch including magazines, blogs, and more. 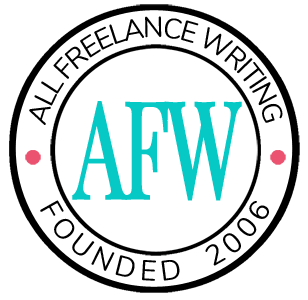 Find a wealth of freelance writing advice, tips, and more in the blog archives. Get your own writing questions answered on the All Freelance Writing blog or in a podcast episode. Listen to the writing podcast archives (under the former All Indie Writers brand). Learn how to write and publish a short .pdf e-book to sell or give away as a marketing tool. Learn how to write and distribute effective press releases for your writing business. Calculate existing conversions or figure out how many sales you need to make to reach your conversion goals. Use this tracker to keep track of your monthly blog post schedule. This tracker can help you reach a goal of writing a query letter each day for 30 days. Pitch 30 guest post ideas in 30 days using this tracker and challenge. Focus on flash fiction with this monthly challenge and tracking worksheet. This tracker worksheet can help you get into the habit of writing every day. Set your own monthly word count goal and use this worksheet to stay on track. Calculate the average hourly rate you need to charge to reach your income and savings goals. This keyword density analyzer was created specifically for writers, emphasizing both SEO and readability. Use this tool to track and share progress on your projects, during NaNoWriMo or any time. Use this template to help you write press releases for your clients or your own news. This worksheet can help you outline key elements of client case studies. Use this worksheet to help you lay out key points before writing client white papers. Use this worksheet for monthly / quarterly / yearly progress checks on your goals. Map out an action plan to reach any writing or personal goal. Learn how to market your book in just 15 minutes a day with this tip sheet. Promote your writing business with these 41 types of content marketing tools. Download this free action plan template to help you reach your writing goals. Find out what an author website should include, and get author blog post ideas. Create a blog business plan with this free downloadable template. Use this book marketing plan outline to help you sell more books. Learn HTML basics for your freelance web content and blog posts. Plan your monthly marketing activities with this free calendar. Download a free Markdown cheat sheet in this post on blogging with Scrivener. Create a short-form business plan with this one page business plan template. Quickly outline your marketing plan with this free one page template. Use this free worksheet to plan new projects, like a blog launch. This is a simple press release template you can adapt to any book launch. Use this template to write case studies in Scrivener, for yourself or for clients. Manage the content of multiple blogs in Scrivener with this free template. Manage a single blog's content in Scrivener with this template. Write white papers in Scrivener for yourself or for clients with this template. Conduct a SWOT analysis to examine your competitive strengths, weaknesses, and more. Use this worksheet to narrow down your target market as a writer.